Been out of the house for a loooong time, but not out of the RX-8. 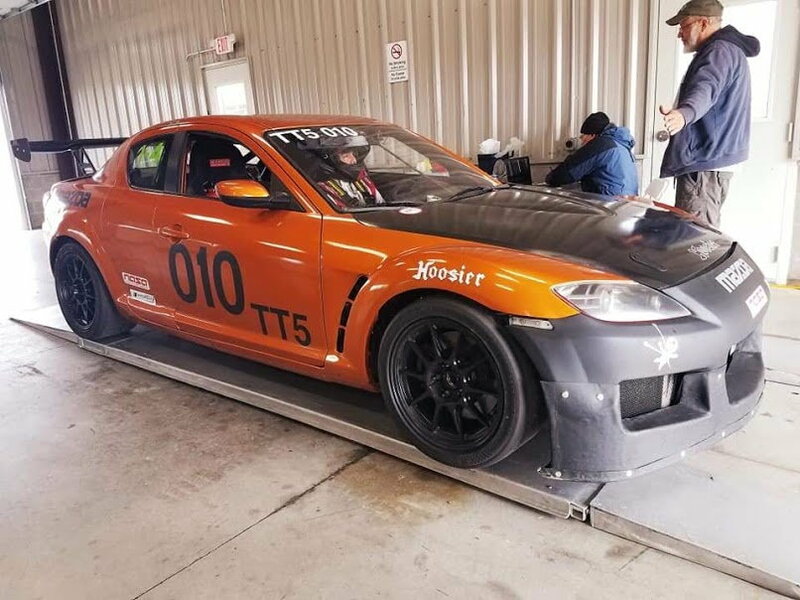 And the “RX-8 in NASA ST5/TT5” thread hasn’t seen action in a while, so maybe this will renew interest and jump-start it. First, wheel and tire choice: I’m running 245/40-R17 Hoosier R7s, which do pass the 266mm template when mounted on 17x9 Konig Dekagrams. Very-very close, but they pass w/at least 1mm to spare. I am running aero and picked up the wing gurney that Team recommended (many thanks). Sadly, the front splitter had to go (couldn’t afford the modifier), but I was still able to reuse all of the base I built. So to recoup some of the front aero, I made a class-legal air dam similar to what the Miata guys do. That bought back a fair amount of area along the leading edge of the front under-tray. I just made a mini-foot that bolts in place of the old splitter (meets up with the air dam). 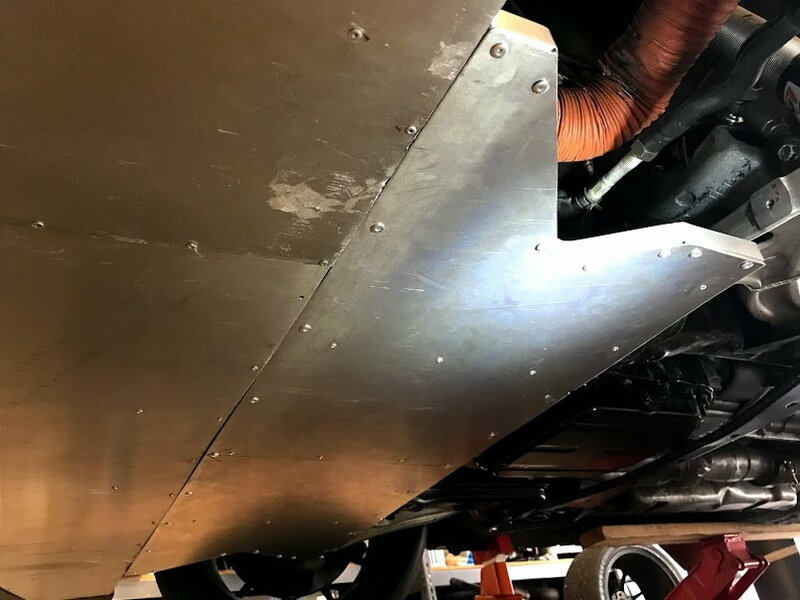 A much larger area was gained by finishing the rearward portion of the under tray and pushing it back to the legal limit (front wheel centerline). I scalloped out some of this to clear the wheels at full steering lock. I finally got around to pressing in some offset bushings to get the front negative camber I wanted. And I added “functional ballast” in the form of a passenger seat & harness. Apart from that, the big change was in finally addressing some of the mangled body panels. Then we wrapped the car (did it myself w/help from a friend who was also clueless – so it’s a darling in pics and from 10’ away…just don’t get too close…it gets ugly). She looked pretty darn fast. We set the Autobahn CC - South track record in ST5 and TT5 (not great times, but in ST5 the driver was new to the car and in TT5 I was on my warm up session getting it ready for the ST5 driver...much more time still in the car). We're about 3/4 seconds behind the track record at Mid-Ohio, which I'm convinced I can take down under good conditions. Should be able to take Gingerman as well. The car is coming into its own and its starting to make sense to me. Then I killed the trans about a month ago or so. I suspect it was dying as early as Gingerman (June) and very likely at Pitt (July) where I missed shifts that I recall felt just, well odd (like hitting a block of wood rather than a gate). Matt got a nice front seat view of the missed shift at Pitt… Anyway, by the final Mid-O event (Aug), I couldn’t go more than a lap before it would stop going into gear. Since I had a “spare trans” from TechSport, the replacement took 3x longer than it should’ve…yeah, because “spare” really meant “incomplete,” and “race part” seems to mean “just jam in a 7/16” coarse thread bolt into the flywheel-counterweight’s M10-1.25 bolt holes, then strip out two other holes and spin that f’r to 9K RPM.” ARGH! Thank goodness there’s not much left of their work on the car. She’s back together now (properly) and ready for a shakedown run at Road America. After that, we’ve got one final event at NCM to finish off the season. 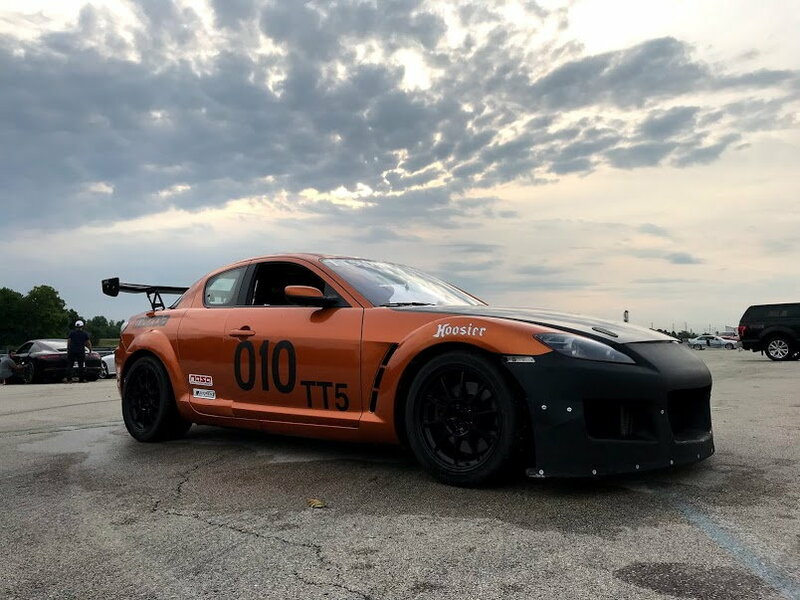 If the car is mechanically sound (knock on wood, wood products, wood veneer, and anything remotely resembling wood) and the weather holds, then I hope to absolutely crush the current TT5 and ST5 track records. nice build. i'll have to copy that front air damn this winter :D. i wanted to run the mazdaspeed bumper but i couldn't because i was still running TTD this year, and ST5. 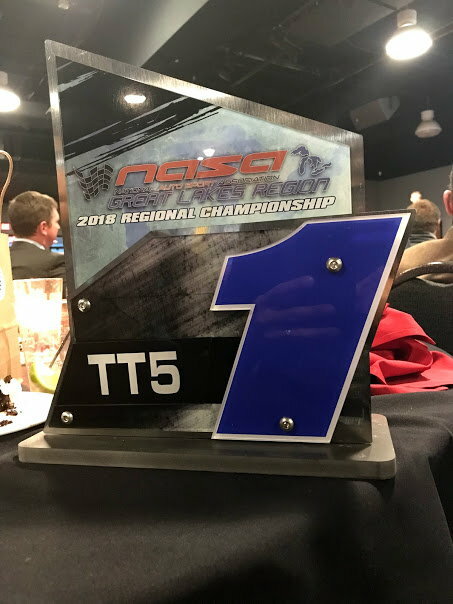 no more TTD next year, so the car will be full fledged ST/TT5 next year. are you running stock engine? does it make enough power to max out p/w ratio for the class? you said you had to add passenger seat for ballast. my comp weight is 2850.
i was at Pittrace when the engine decided it had enough. wanted to chat with a few other rx8 guys there but i needed to load the car up and get on the road before dark. hope to battle with you at Pittrace and mid-o next year. My engine is mostly stock - the latest build was really focused on upgrading seal materials to address the high heat of track use. I wasn't after "more power" I was just after something like reliability. I am running pretty open intake and exhaust, so power is right on point for ST5/TT5. My comp weight used to be 2800 with me in it, but the seat and ballast box raised it to 2890 for this year. We got hit with a 0.7 modifier for the A-arms this year, and it goes up to 0.8 for next year. So you're looking at a 14.8:1 target for next year. That's if you're not taking advantage of the non-aero modifier which cuts you a break for running with a base-trim, totally-stock body (sans some minor allowances). With ave. power around 196 rwhp, I'm hitting the numbers where I like it. In theory I need to add a bit of weight next year for that extra 0.1 penalty the A-arms will bring, but I'm not even sweating it. That comes down to about 11 lbs, and I rarely run on a near-empty tank. Nothing two gallons of gas doesn't address. Personally, I think the car fits extremely well in the class. Look forward to seeing you out there! I'm easy to find at any of the NASA Great Lakes events. the a arm penalty will remain .7 for next year. it's been officially announced. if you're making 190+ avg whp, that's a strong stock motor. i thought most stock motor only make 195 peak, so probably 185 avg. what has been the common failure on your motor? apex seals or side seals? my new motor has cnc ports, rx7 full depth apex seals. the builder said to stay with oem seals for better wear on the housing. i was going to go with oem size ceramic seals but they didnt have any in stock and would take months to get. i didnt want to wait and wanted to finish the season with a few events left, so i went with rx7 seal option. i'm going to keep the rear wing and give up the .4 BTM points, so i can run different front bumper and font fascia like yours. i just redid my class form for 2840 lbs and 191 avg hp. i'm also looking to run e85 next year to gain a little more mid range power while dropping engine temp. will have to see if the gas tank is big enough to finish the race. Third engine: same build (mild street port on exhaust), Racing Beat tune, loving it so far. 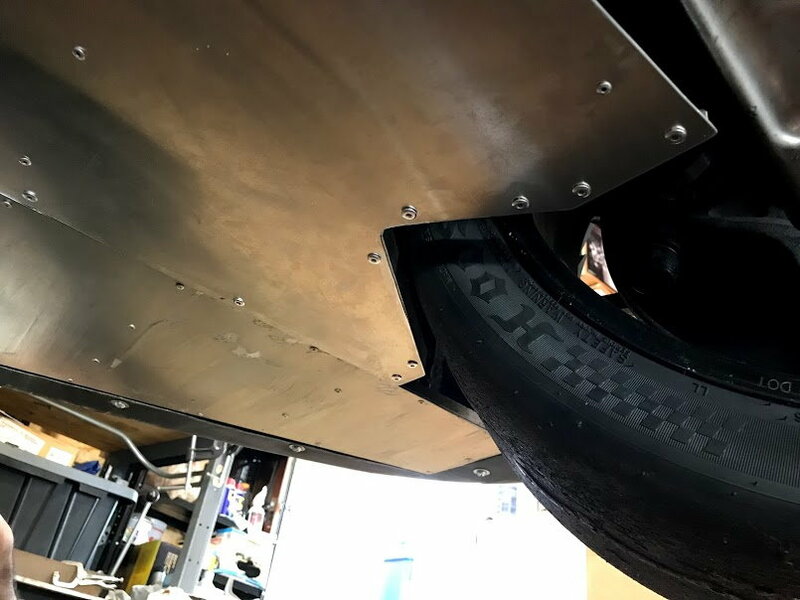 My builder is Banzai Racing, and he uses premium aviation grade apex seals (better metallurgy than OEM seals) along with Viton upgrades everywhere to replace OEM rubber for better heat tolerance. 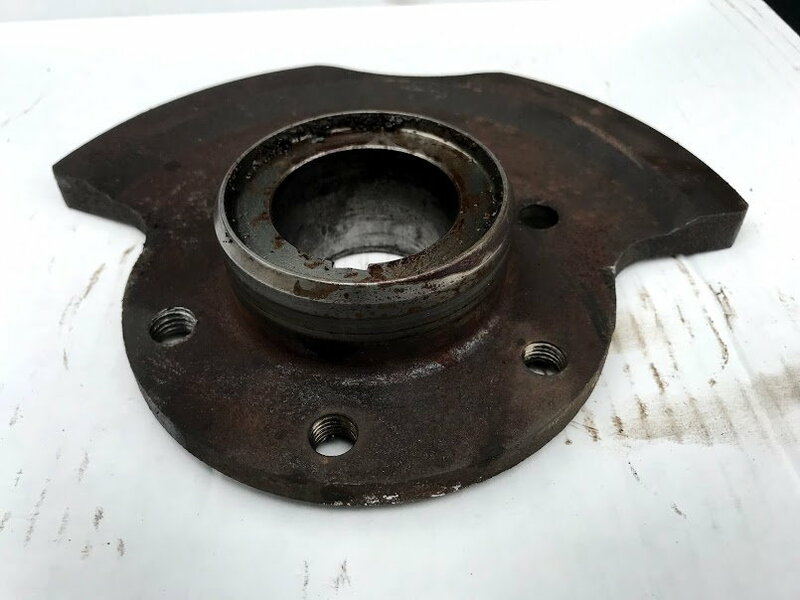 On the rotors, we could've used the ceramic seals I have, but their failure mode (shattering) tends to take out an entire rotor/housing. When the aviation seals fail, you just lose compression as they sag, and that's identifiable long before major damage occurs. So I chose that margin of safety, figuring maintenance rebuilds are cheaper than new engines. My current engine benefits from a really nice exhaust system - great headers, no cats, race muffler (i.e. big can doing a "muffler impression"), just flow-flow-flow. So she's strong for a mostly stock mill. But she's also loud, like really loud to the point neither passengers nor I can hear anything over coms. So I'm going to try out a different muffler to see if it helps. Good to hear the a-arm penalty isn't changing. Won't make much difference for me (or most folks I suspect). Kind of a silly proposed change anyway (0.1 point...meh, whatever). Gas tank big enough? Are you running a small fuel cell? I typically drive in Time Trial, so that little 15 min run is never a concern so long as I remember to put fuel in the damn car...*ahem* We've also run standard 35 min sprint races in ST5 (with no FCY) and had no trouble making it through the race. Of course, you'll be going through E85 at a quicker pace, so the sprint race duration might be a concern. Doubt TT will be hard to make. the engine builder told me the ceramic seal seals better and make more power, and last much longer. and it would take a lot of abuse to shatter them. i was actually going to go with the rx7 ceramic seal. i hear you on the exhaust. i have 3" header back with a small muffler at the back, obx header for now. i put 800 street miles on the new engine to break it in and it was unbearable without my noise cancellation headphones on. the exhaust tone on the new ported engine is much louder than the oem engine. 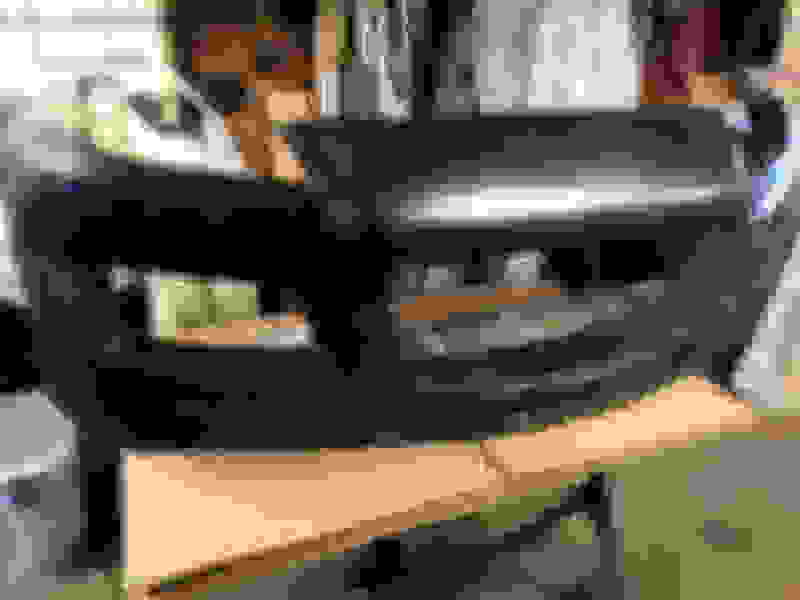 i got a magnaflow 16" long resonator that i'm going to add to see how much it will quiet it down. if not, i'll add another muffler at the CAT section. oh and NASA National will be at Mid-O next year. looks like i'll be making a few trip out there to learn the track. 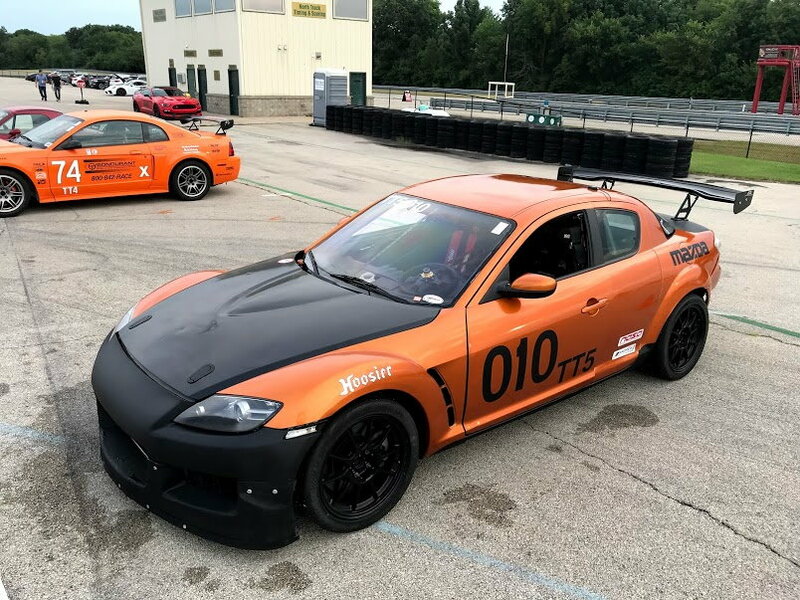 RX-8s at Nationals - REPRESENT! I am so glad you posted a picture of your air dam work. I want to do pretty much the same thing this winter. I'm not certain yet whether I want to do a splitter. Wow, can you afford the splitter points? I've only got a measly 0.1 points to spare, but I'd LOVE a front splitter. The wrap looks great. did you keep the bumper and hood black because of all the track grime? i thought of doing that to mine, getting tired of removing all the rubber smears!! I always planned to keep the center portion of the nose black - but wrapped in carbon along with the hood. By the time I finished what you see here, I was so sick of doing the wrap. My first - and last - wrap job. Might as well have painted the car. 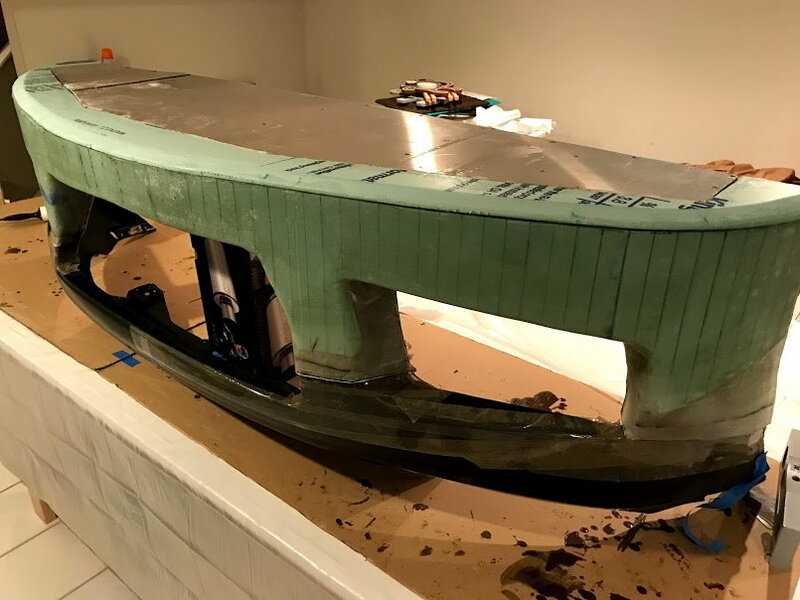 The hood is not done yet, so that's just black e-coat on it now. I'm doing hood vents over the winter, and I'll paint it matte black to match the nose. Banzai does a great job with the customer gallery. I found your car in no time lol, except for the image was a TCA car. nice find. what header is that? is the FD oil pres regulator a common mod? 232 on a mustang dyno does seem very high. if you used that dyno chart for NASA, it would be 255 whp. 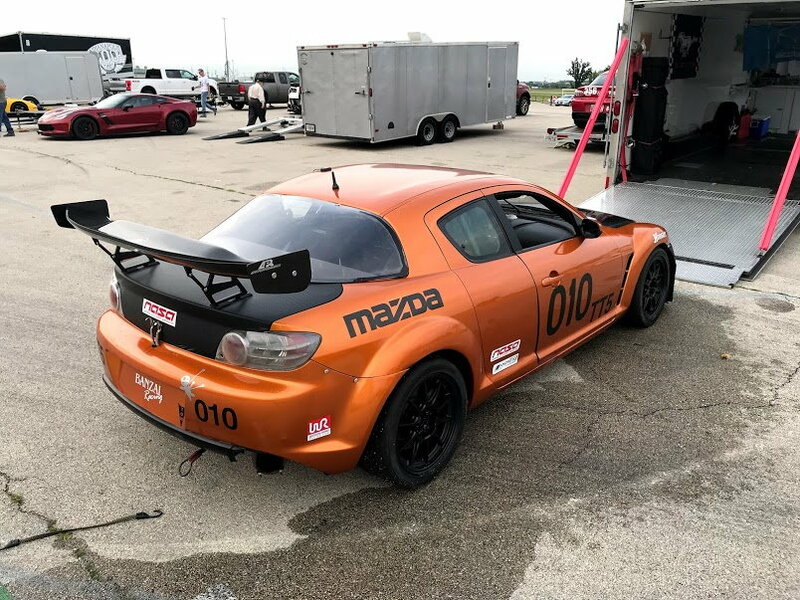 RX8 finished 1, 2 on the championship. nice. The FD oil pressure regulator is pretty common. The OEM regulator was found early in the car's introduction to be set too low - I think the 2009 or so cars have updated regulators (not sure on the exact year change). The header is an old race part - I think Team knows who made them originally. Nice piece. Yeah, that first dyno was what made me originally think TT4 was a good fit for the car. Way too high. Mustang Dynos are not legal for classing purposes (unless your car is all-wheel drive), so when I got my Dynojet numbers I was shocked - and immediately switched to TT5. Perfect fit for the class (once I dropped the front splitter). Yeah, I think I can. Not sure whether it's worth it, because I've never used one. My car has a very-very mild understeer at high speed, so I'd like a bit more aero bite up front. This is with the wing set at 0 AOA, so a bit more bite up front would allow me to run more wing angle to increase the overall DF on the car and still remain near neutral at speed. That's why I said I'd prefer a splitter over the simple air dam. Now, whether or not that would be a real advantage would take testing to determine. I'm still adjusting to the high-speed capability of the car, so I don't feel I have a baseline set yet to compare the benefit of a splitter over the dam-only nose. Last edited by R(ace)X-8; 11-04-2018 at 06:20 PM. The NASA Great Lakes 2018 season is officially over. After a very long and trying season, and a most challenging final weekend, I managed to finish as the TT5 Champion! Along the way I set another track record for TT5 too. I went to NCM with two goals in mind, lock up the season and break the record there. Two for two! Very happy about that. None of it was made easy though, as Nick kept the pressure on to the very end. I mean, the season was literally up for grabs all the way until the last lap of the last session of the day. I was struggling with track position and traffic, but I managed to finally get past that and spy Nick in the distance. That lit a fire, and it was on! In the end only 5 points separated us out of around 1300...a super close season! 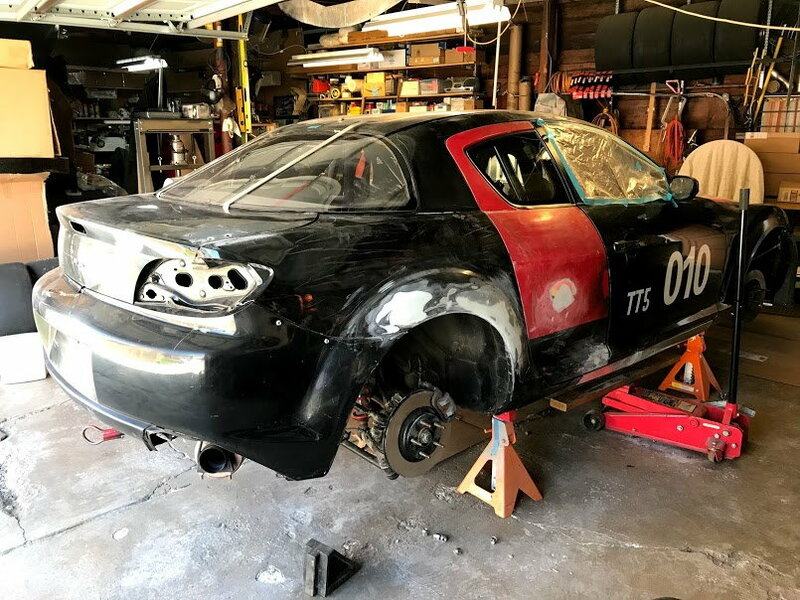 I’m already looking forward to next year – I have a few plans in the works to improve the car (umm…I should probably have that blown shock repaired too), but mostly it’s still all about driver development. On that front, there’s a ton of room to grow. Do I need to give Nick some crap about not beating you when I see him this weekend? Because I can totally do that. Thanks! At Mid-O, I sure hope we see RX-8s representing well. At Pitt...man, that's a tough one. I take beating track records seriously only when I feel pretty confident I can do it. So yeah, Mid-O is in my cross-hairs. Pitt Race though? If Matt or Ardolino show up again, you've got a real fight on your hands. Those dudes are really fast. I do love Pitt though, so upping my game there would be nice (I'm under 2 min there). But make no mistake, next year is all about Mid-O. And no, Nick certainly doesn't deserve any crap for 2nd. He had me pacing in the paddock before the last run - literally pacing up and down. The season could've easily gone to him had that Miata gotten in the way on the last lap instead of 2nd to last. It was close, and Nick did himself proud. Thanks, John. You pulled out a brilliant performance in the last session to take the season. I'll tell you how it looked from my perspective. I am normally pretty timid with traffic. I don't like to get in anybody's way or hold them up, even for a couple corners. So I get bogged down in traffic a lot. I put that away Saturday. I pushed from the very beginning, trying to make sure I had traffic between you and me. I even pushed in that damp session so I could make sure you were back there. And that's how I knew that TTE Miata was fast - he and I had tangled earlier in the day. And that couple hours before the last session was the most pressure I've ever felt in competition. I watched you pace around. I checked things over. You paced around some more. I put more gas in the car. Then more. In that last session, I knew you had to scrub in those new tires, clear traffic and put in a faster lap than you had all day while judging change in grip. I saw you side-by-side with that Miata in 6, 7 and 8 and knew at that point that you had it. You were not going to let that go. I spent the next lap doing the best I could, but my used tires were acting older than I expected them to. I honestly didn't watch my mirrors on that last lap. I was concentrating on my lap and knew you were back far enough not to actually pressure me for position yet. When I looked back coming out of 23, I was pretty surprised to see how close you had gotten. The fist I threw up in the air as I crossed the line was for your performance, and for an exciting season. 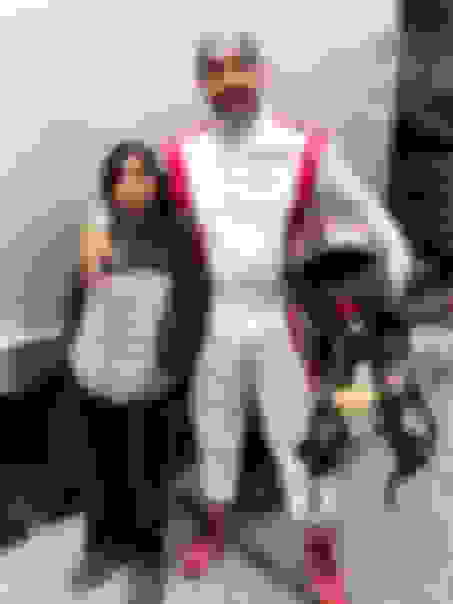 It was awesome - exactly what club racing should be. I had made the fateful decision two weeks prior to not bring new tires. But it was still a nail-biter. Thanks for a great sesason. Last edited by Mr. Pockets; 11-06-2018 at 08:18 PM. Next season should be a blast.